Spring is finally showing signs of appearing. Grocery stores and hardware shops are full of promising little plant starts and bags of compost. People are emerging after winter with dreams of making their gardens ever more beautiful. We’re feeling inspired by magazines, televisions shows and neighbours to develop that outdoor living space and make it a true oasis with flowers and maybe even a plot of vegetables. Gardening is a relaxing hobby… unless your dog is a digger. In that case, it can be stressful and frustrating. Those lovely little plants and upbeat gardening displays might fill you with despair if you know your dog is going to unearth the flowers and destroy the lawn. But there is hope! Dogs can and do outgrow this annoying habit, and they can also learn to control their urge to dig. It will take some effort, but even dog owners can have nice gardens. 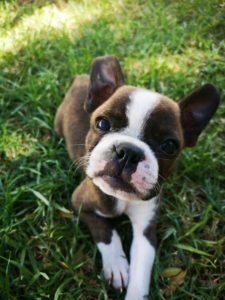 Whether your dog is a rambunctious puppy or an older dog with a well- established digging habit, he can change his ways. Dogs dig in the garden for a few different reasons. Understanding why your dog is digging is the first step to stopping it. Dogs dig for three primary reasons. The good news is that is not that hard to figure out which one is motivating your dog. You don’t have to be a doggy psychologist. You just have to pay attention to where your dog is digging. Of course, his motives might best fit into the category ‘all of the above’ – in which case you can tackle each situation and use a range of approaches to stop ALL of his digging. 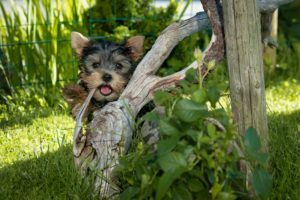 The Escape Artist – If your dog is digging along the border of the garden or under the gate, he is probably trying to escape. If you have a fence, and your neighbour has a dog, this is a common issue. Your dog might want to go visiting next door, or he might want to go off for an adventure – neither of which is a good idea. Happily, this is the easiest situation to address. Buried ‘Treasure” – Your dog has a very different idea of treasure than you do. And in this situation, he isn’t working alone. He often has a feline co-conspirator. Cats leave a few unpleasant things in gardens, primarily rodents and birds they’ve killed and their own waste. Distasteful as it is, dogs are absolutely delighted to discover these things. If your dog is digging in loose soil such as that flower bed you worked so hard to dig, suspect that a local cat is using it as a big outdoor litter box or burying its unfortunate prey there. Or it could be leaving the bodies somewhere else in the garden, and your dog is burying them there. The Joy of Digging – This is the most frustrating and difficult type of digging issue. Some dogs just love digging. They delight in the feel of their claws tearing through a lawn and reaching the soil beneath the grass. These dogs will rip your lawn apart gleefully. They aren’t trying to upset you. It’s an instinct they have, and they are simply obeying it. The challenge is to teach them to obey you instead. One simple thing can discourage all forms of digging: walks. A dog who gets a good daily walk for at least 20 minutes is less prone to boredom, less stressed and more tired. All of that will help stop him from digging. Two walks a day is twice as good. Extra play time, toys and chews will also help. If your dog is an escape artist trying to tunnel out of the garden, he might be bored or lonely. Vary his walking routes to keep his life interesting. He might be tempted by something on the other side of the fence, which is trickier. In this case, the best approach is to make it impossible to dig under the fence. You could put in a raised bed along the problem fence, or a row of concrete slabs. If digging there is too difficult or not rewarding, your dog will get discouraged. And of course, if your dog is not neutered, neutering will help dampen your dog’s urge to go roaming. If your dog is a ‘treasure’ hunter, it is difficult because it is very hard to stop cats or small animals from visiting your garden. Above all, remember that your dog will encounter anything you put in your garden. Make your garden less attractive to cats by planting in any areas of loose dirt. Sand and very fine gravel will appeal to cats as a toilet facility, so avoid those. Be vigilant about inspecting and cleaning your garden, and focus on distracting your dog. Check the garden before letting your dog out, and increase his exercise so boredom doesn’t make the ‘treasure’ more appealing. Both ‘treasure’ hunters and dogs who just love to dig will learn from compassionate correction. Go out into the garden with them, and if they start to dig, firmly say ‘no’, bring them inside immediately and then ignore them for the next 15 minutes. With consistent repetition, they will learn that digging has consequences they don’t like. When they go out and don’t attempt to dig, reward them with a small treat when they come back inside. Leader Train Me treats are full of nutrition and low in calories, so you can give them several a day. Some other things that can help are keeping your dog’s nails trimmed and providing more toys and chews. Dental sticks are great because dogs get such enjoyment chewing them for several minutes, and meanwhile the stick is cleaning their teeth.